What could possibly be better than the iconic, fun-to-drive Beetle? That’s easy — two of them. Take your pick from the always-classic coupe or the sun-loving convertible. Then enjoy the comforts of modern technology with the spirit of an old soul. This Beetle is the perfect one-two punch. It’s an icon and an original, once again. That’s because we gave this classic some modern touches. Like a 2.0L TSI® 174-hp turbocharged engine. Available Bi-Xenon headlights with LED Daytime Running Lights in front and LED taillights in back. Plus a 6-speed automatic transmission to put everything into high gear. 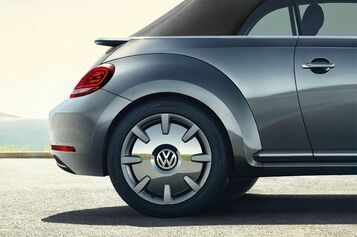 * The Beetle shows that fun never goes out of style. It’s not just the outside that thinks outside the box. Thanks to its retro-modern gauges and multi-function steering wheel, as well as the available customizable interior lighting and heritage-inspired glovebox, it’s sure to turn heads even standing still. Drive on the bright side of style. 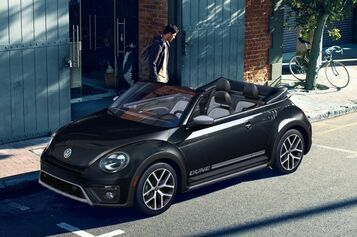 Along with top-dropping sunshine, the Beetle Convertible also offers standard turbocharged power, iconic style, and a tech-savvy interior all under its retractable roof. Lifting the lid on quality. When it comes to the interior of the Beetle Convertible, creature comforts abound. From ambient lighting to leatherette seating surfaces, its craftsmanship puts you first. 1 Starting MSRP of $25,440 for a 2018 Volkswagen Beetle Convertible S 2.0L TSI® with 6-speed automatic transmission. Prices exclude transportation, taxes, title, other options and dealer charges. Dealer sets actual price.